During the Possession War, Mankind took control of the suddenly emerged Continent from evil Drakens. Then Kingdoms of Gondawa send their Lords to colonize it. Will the Mont Azur Peace Pact remain while the lords grows and rules their ways ? - 2-7 Guilds War : Each team start from an area type. - 8 Wonders War : only 8 starts ! Review by Nathan on 4/19/2013. 3 stars for now, but it could be a 5 with some work. This is a nice looking map and fairly fun to play. 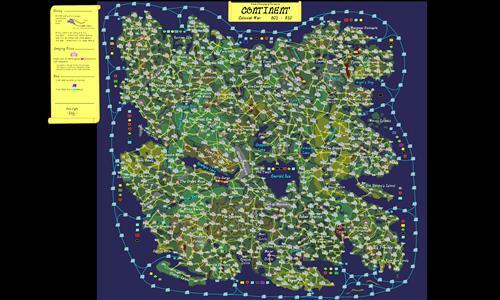 Unfortunately, it is so cluttered with detail that it's difficult to see the actual territories. Also, although the bonus system with the castles is explained well, it makes gameplay awkward and tedious. Games tend to be extremely long - and not just because the map is huge. Rather, the bonuses themselves are too small and the number of bonus territories is too large and the territories themselves are far too scattered to be able to collect effectively. Making the territories graphically larger and easier to see and simplifying the bonus systems will greatly improve this map. Review by General Scott on 10/18/2012. It's a monster, but very well done! 9 out of 11 people found this review helpful. Review by Mirodian on 3/24/2013. The unique structure of cities and the system of reinforcement bonuses per city makes for a really interesting game, and the sheer size, while dragging out a game, is still nice. And the rich layout creates somewhat of an atmosphere with the names and whatnot. However, having to control all connecting city gates to a particular city to receive the reinforcement bonus for a city is weird, but still fairly insignificant. Review by Rennideren Flutterfickle on 12/18/2012. Nice map, but the names on some territories are very bad, and taking each castle is fairly annoying due to the three territories per castle 'feature'. Review by [REGL] Pooh on 2/11/2013. Neat Idea... too tedious to play on regularly. Review by Antares on 10/29/2012. The idea regarding the cities is nice, but as a whole, the map is too large in my eyes. Review by [SoL] wbwright on 10/11/2012. Creative and different. Would like it smaller. Review by Krulle on 12/21/2012. Great map, takes a while to end. I just missed the road marking in "The Daedalus", but once you get your head around to how the Daedalus is structured it's okay. And the bonus structure takes a bit to get used to to optimise starting strategics. Review by Aiko's Army on 3/27/2013. This is a very big map and it may take more time to conquer than other maps. It is a very elaborate map too. Review by max.k on 8/16/2015. Review by Andalorium on 8/22/2016. I Love long games, but the whole gate for each city through me for a loop in this game, well laid out it just took getting used to. Review by A_B3 on 5/13/2018. Huge. Though I dislike territories that are dead-ends (making movement of forces prolonged) it is an interesting game. The low scoring makes for a very long early-game phase and taking of full castles in the mid-end game challenging as well. A worthy play if you have the time.